Don’t forget to select “SWIM” tickets for the most amazing experience of all - swimming with dolphins!. 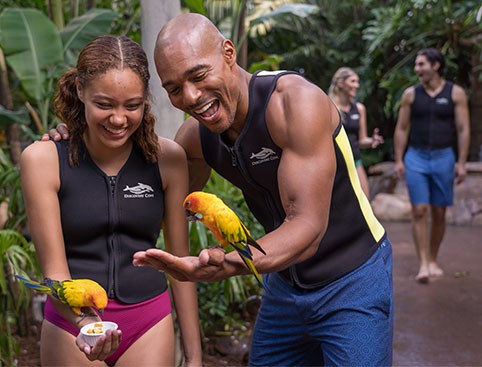 Each of our all-inclusive Discovery Cove packages include snacks, full meals and drinks throughout the day, use of all equipment such as snorkels, wetsuits, towels and swim vests, the use of beach chairs, sunscreen and lockers and free all-day self-parking for your car. 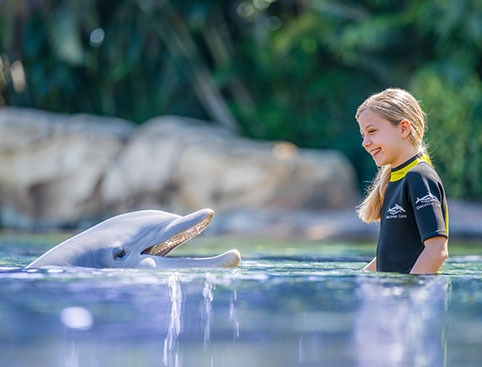 Swim with dolphins in the Dolphin Lagoon, feed the exotic birds in the Explorer’s Aviary and enjoy unlimited use of the wonderful Discovery Cove beaches, pools, tropical lagoons and coves. 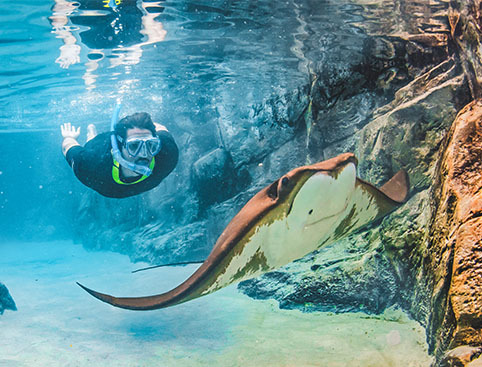 Indulge yourself with a day at Discovery Cove. The 10,200 square-metre tropical, underwater world features multiple levels of exploration. From shallow waters to deeper swimming adventures and white sandy beaches, to snorkelling among canyons inspired by reefs from around the world, The Grand Reef is perfect for families. Freshwater Oasis features swimming and wading adventures and face-to-face encounters with playful otters and curious marmosets. Designed with a rainforest canopy above and sparkling clear springs below, Freshwater Oasis is a natural fit with Discovery Cove’s tropical vibe. 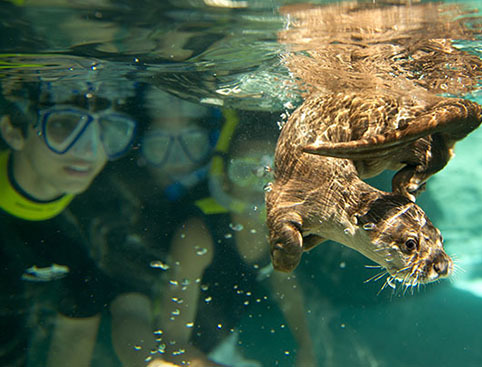 All of the family can experience this tropical setting, with most of the water at waist height and various levels of exploration where guests can wade, swim and float in the water-filled trails and discover marmosets and Asian otters. Freshwater Oasis is included with your admission to Discovery Cove. FOR 2018 departures only: Your Ultimate Swim or Ultimate Non-Swim Ticket entitles you to FREE parking on your first visit to either SeaWorld Orlando, Busch Gardens Tampa or Aquatica Orlando. When you receive your 3-Park Ticket (on your first visit to any of these parks) your ticket will automatically include unlimited free parking to all parks during its validity. NO amendments can be made on Discovery Cove bookings. If a booking has been made and is incorrect it will need to be cancelled which may incur charges. Dolphin interactions must have a “Minor” waiver completed by the parent/legal guardian. If the parent is not present at check in we will also need a photo copy of their DL or government issue photo ID to verify signature. Chaperones will be able to sign waivers if they have been given legal guardianship/power of attorney and have that paper work on file with Group Sales or bring a copy of that paperwork on check in. For swim packages, children must be over 6 years of age.